Any woman who wants to have a cervical smear test will be entitled to have one free of charge at a GP surgery or clinic. The move is aimed at alleviating the fears of thousands of women who are worried about their test results in the wake of the CervicalCheck scandal. GPs were issued with guidelines yesterday and told they will be paid for the extra test or a consultation with a patient who does not opt for additional screening. It comes as a group of senior doctors yesterday said they wanted to reassure women they can have confidence in the CervicalCheck screening programme and there was no evidence available to them that there are problems with the standards of analysing tests. Dr Jerome Coffey, head of HSE cancer services, said that cervical screening had its limitations, but a woman's risk of a false negative smear was less than one in 100. "There is a small risk that cell changes will not be picked up. "It is important to have regular smear tests. We will be one of the first countries in the world to introduce HPV testing later this year, replacing technology that has been around since the 1950s," he said. Chief medical officer Dr Tony Holohan said the problems with CervicalCheck related to communication with patients rather than quality control. It is essential that women continue to have smear tests and since CervicalCheck started in 2008 there has been a 7pc a year drop in the incidence of cervical cancer. 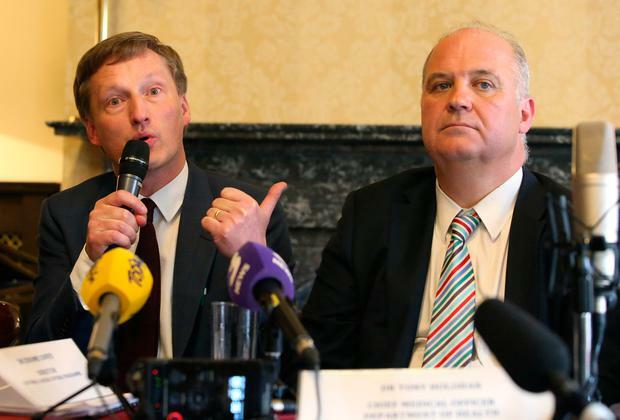 "Before that gynaecologists were coming back to work in Ireland and often seeing women with late-stage cervical cancer," he said. The screening programme was having an impact on mortality and picking people up earlier, he added. Prof Donal Brennan, a specialist on gynaecological cancers in the Mater Hospital, said the vast majority of cervical cancer was diagnosed at an early stage due to the screening programme. Women whose test shows up abnormalities and are sent for further investigation have a very low risk of progressing to invasive cancer. Anyone who had a negative smear test result should be alert for possible symptoms of cervical cancer before their next recall date. Dr Mary Short, a Dublin GP, said these symptoms could include vaginal bleeding. She said GPs were under pressure to deal with the regular volume of patients but they would do their best to accommodate women who wanted a repeat smear test. The consultation is likely to take longer than a routine smear test because the patient is likely to have more questions and concerns in the wake of recent publicity. It is understood that negotiations are under way with the Irish Medical Organisation to pay GPs a higher fee for the re-test in light of the longer length of time they will have to spend with the patient. The guideline to GPs from CervicalCheck says that if they had a patient who was diagnosed with cervical cancer since 2008 they may be referred to have their case audited. About 1,500 women who developed the disease in that time were not notified to CervicalCheck. The audit looks at whether they had a smear test result which gave a false negative in advance of the disease.